AIFD Bangalore Admission 2019 - Army Institute of Fashion and Design (AIFD) Admission 2019 is offered in various UG and PG Courses for session 2019-21. Candidates who have interest in the courses offered and are eligible for the same can fill and submit the application form before the last date. The Institute was established in Bangalore in 2004 under the aegis of Army Welfare Education Society (AWES) to impart quality education in the field of Fashion and Design to the wards of Army Personnel both serving and retired. They contribute to the economy of the country with millions of pieces of clothing and accessories purchased by consumers on a yearly basis. PG Course: Limited seats are offered for Civilians for PG course. Admission to the Army Institute of Fashion and Design is for the children of eligible serving Army personnel, eligible ex-Army personnel and wards of war widows/widows of the Army. Children of following categories of Army personnel are eligible and they are required to submit the relevant certificate as given against the category applicable to them as proof of their eligibility for admission to Army Institute of Fashion and Design along with the Application Form. Children of ex-Army personnel granted/awarded regular pension, liberalized family pension, family pension or disability pension at the time of their superannuation, demise, discharge, release medical board/invalided medical board. This includes wards of recruits medically boarded out and granted disability pension. Step children are eligible provided they are born from a wedding where at least one parent belonged to the Army who is otherwise eligible. Wards of only those ex-Army medical officers/Army Dental Corps officers presently serving with Indian Navy or Indian Air Force who have served with the Army for 10 years. The applicant must have passed 11th and 12th Std. having studied same combination for two years regular students with a minimum of 35% aggregate marks from a board recognized by UGC/University. Bangalore University norms will be followed with regard to admission approval, refund of fees and retention of original documents from time to time. Candidates who have passed their 10+2 examination as a regular candidate are only eligible for admission to B.Sc. (FAD) as per Bangalore University norms. Candidates who have passed through distance education system or privately through NIOS (National Institute of Open Schooling) have to offer the same combination of subjects in both 11th and 12th Standard. UG admission through Written Admission Test (WAT). Besides fulfilling the eligibility conditions as per Para 1 the candidates should be certified by MH/RMO/Registered Medical Practitioner as Physically and Mentally fit to pursue the course; a certificate to this effect in the enclosed form is required to be submitted by the candidates at the time of admission. Selection Procedure for Written Admission Test (WAT) - The Written Admission Test (WAT) 2019 for admission to the UG Course offered by the AIFD Bangalore, will be held on Saturday 18th May 2019 from 1430 hrs to 1730 hrs at the notified examination centres as below. The candidates are required to report at their respective examination centers at 1400 hrs i.e. at least half an hour before the commencement of the WAT. The result of the UG WAT will be declared on 27th May 2019. Result of the PG CAT and Interview will be declared on 30th July 2019. These results will be available on the Website of Army Institute of Fashion & Design. 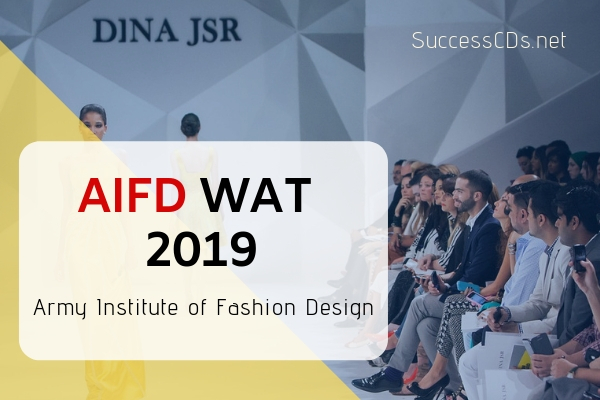 The result of the WAT published on 27th May 2019 will be put up on the AIFD website www.aifdonline.in. The result will also be displayed in the college Notice Board. Candidates declared to have passed WAT will also be individually informed by AIFD Bangalore to this effect. The short-listed students will be required to pay the Course Registration Fee of Rs.10,000/- & Rs.5000/- for hostel through a Crossed DD in favour of “Army Institute of Fashion & Design” payable at Bangalore on or before 6th June 2019 (within 10 days of publishing of the WAT Results on the web site). After the receipt of registration fee from the willing candidates, final list of UG admission will be announced in the Institute website on 08th June 2019. The PG candidates have to appear for the CAT and interview on 19th July 2019 (Friday) at AIFD, Bangalore. The candidates recommended for admission to the PG Course at AIFD, Bangalore will be informed through web site on 30th July 2019 and they will be required to pay Rs.10000/- as Registration Fee for college & Rs.5000/- for Hostel, through a Crossed Demand Draft in favour of “Army Institute of Fashion & Design” payable at Bangalore on or before 12th August 2019. Hostel admission is provided on the availability of accommodation and preference is for the wards of Army Personnel. Candidates are required to fill in the form given in prospectus. Prospectus can be obtained by the candidates from the office of AIFD Bangalore, Nagareshwara Nagenahalli, Kothanur Post, Bangalore-560077 through requisition along with a crossed demand draft for Rs.550/- (with includes Rs.50 postal charges) in favour of Army Institute of Fashion & Design payable at Bangalore. Prospectus is also available at the Institute, Army Headquarters (AWES) and all the command Headquarters (AWES) on payment of Demand Draft of Rs.500/-. Students downloading the forms from website will have to attach a draft of Rs.500/- along with the application form towards candidateship for WAT/CAT. The admit card for the WAT/CAT will be sent to the candidates by ‘Registered Post’ on the address indicated by them on the white envelope provided with the application form. Candidates are requested to affix stamps of Rs.40/- for the purpose; admit card will be sent only on receipt of the filled application.